Social interactions are widely recognized to play an important role in smoking initiation among adolescents. In this paper, we hypothesize that emotionally stable, conscientious individuals are better able to resist peer pressure in the uptake of smoking. We exploit detailed friendship nominations in the US Add Health data, and extend the Spatial Autoregressive (SAR) model to deal with (i) endogenous peer selection, and (ii) unobserved contextual effects, in order to identify heterogeneity in peer effects with respect to personality. 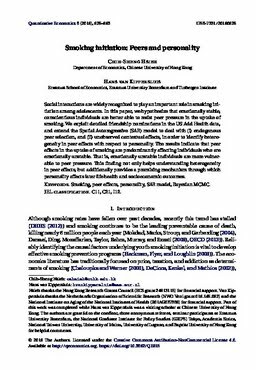 The results indicate that peer effects in the uptake of smoking are predominantly affecting individuals who are emotionally unstable. That is, emotionally unstable individuals are more vulnerable to peer pressure. This finding not only helps understanding heterogeneity in peer effects, but additionally provides a promising mechanism through which personality affects later life health and socioeconomic outcomes.